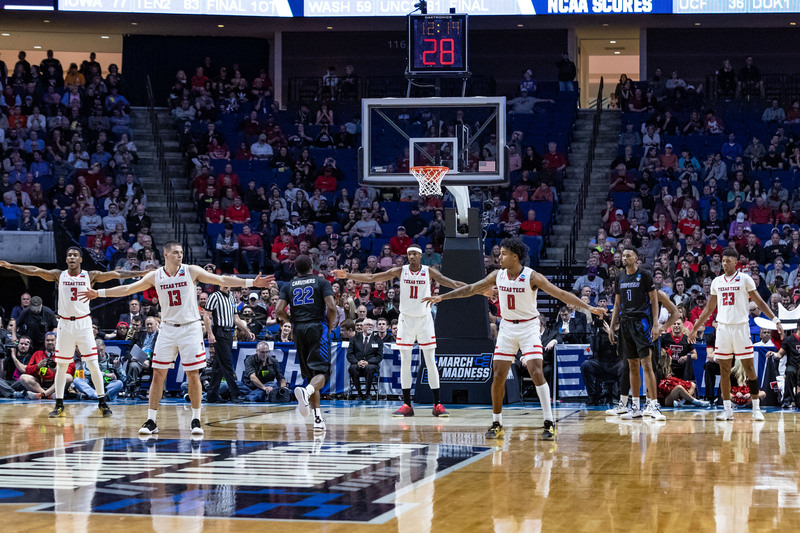 A look into the defensive principles and philosophies behind 3-seed Texas Tech’s impressive run to the Final Four. Going into this year’s tournament, it was the Virginia Cavaliers’ defense that had everyone talking. But heading into college basketball’s final weekend, all the chatter is about what Chris Beard and his staff have done with the Texas Tech defense. “Defense wins championship.” Debatable, IMO. Something that isn’t debatable – the fact that Texas Tech’s defense is a major reason Beard’s group is headed to the Final Four in Minneapolis. Here are just a few of the reasons the Red Raiders are playing into April. We’re all familiar with ATOs on the offensive end, but less common are defensive ATOs. Check out how the Red Raiders used these special situations to slow down the Zags’ high-powered offense and ultimately create some valuable turnovers. On the first Texas Tech defensive play of the second half, the Red Raiders trapped the initial pass. And then after the under 8:00 timeout, Coach Beard threw a little bit of everything at the Zags. Some light 2-2-1 pressure to start. (By the way, Gonzaga was one of the nation’s best transition teams this year, scoring 1.154 PPP). Texas Tech then fell into a 2-3 zone that was really a matchup 2-3. Aggressive defense, even denying a DHO. Icing a sideline ball screen. Trapping the drive with a help defender. Contesting an off-balance 3PA. Forcing a shot clock violation. Remember, the Red Raiders beat Gonzaga by only two possessions. In March, small wrinkles can be (and usually are) the difference between winning and losing. The Red Raiders’ D got an automatic boost this past fall when grad transfer Tariq Owens decided to come over from St. John’s. At 6’10” and boasting a 7’4” wingspan, Owens has the length to alter shots at the rim and the athleticism to contest jumpers out beyond the 3-point line. I get it. He stepped out of bounds after the blocked shot. But he still saved 3 points. Besides, that one play epitomizes the kind of stuff Owens has been doing for Texas Tech all season. “Swarming” was the word repeated this past weekend to refer to the Red Raiders defense. Whether it was in transition, a post feed, a ball screen – there constantly were multiple defenders guarding the basketball, with other teammates close by, ready to help if needed. The deflections, drawn charges, defensive rebounds – those don’t happen by chance. It’s that attention to detail and team pride on the defensive end that has catapulted the Red Raiders to the top of the defensive efficiency rankings and into this year’s Final Four. To check out some of Texas Tech’s offense, click here for FastDraw diagrams on the PlayBank!